Correspondence sent and received by Kansas Adjutant General Samuel H. Kelsey. Correspondents include Major Frank W. Butler, Captain Frank G. Babcock, Perry M. Hoisington, Captain Albert J. Jones, Captain J.F. Lawson, Captain Thomas A. Mayhew, Major E.W. Wellington, Captain Wilton D. Snodgrass, General Wilder S. Metcalf, and Brigadier General Henry Blanchard Freeman. Adjutant General Kelsey requested information relating to appropriation from other state militia and received responses from Nebraska, Iowa, Wisconsin, North Carolina, Virginia, New York, Connecticut, Ohio, Maryland, New Jersey, Tennessee, and Illinois. 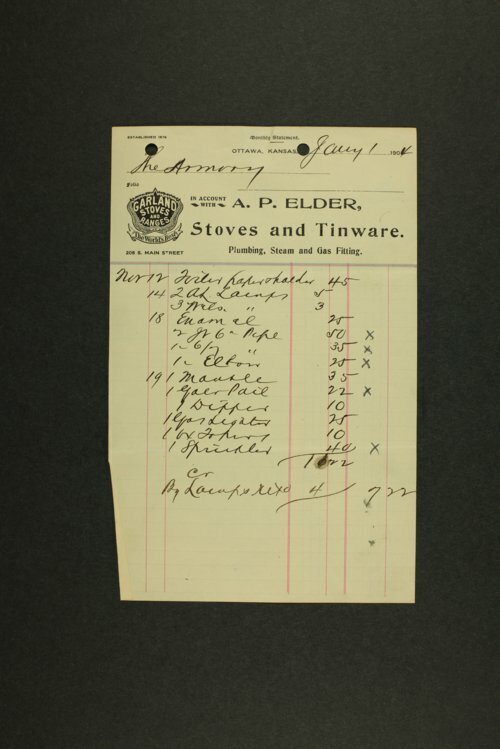 Also included in this correspondence are several bills and receipts for services from Ottawa Gas and Heating Company, Franklin County Hardware Company, Topeka Transfer and Storage Company, and the Missouri Pacific Railway Company, among others.